"I had nothing to lose. I think that helped, because there were points in the race when it was quick and I'm questioning 'this is suicide, running 63s and 64s in the middle of a 10k.' But in the back of the head, I'm like 'I've got nothing to lose. I'm just going to go after it. If I blow up, then so be it. But if I stick on it and am able to hang on, it'll be a pretty darn good result.'" - Chris Solinsky, aka "The Rocket." If Salazar retired tomorrow, what does NIKE do? Solinsky The Forgotten Phenom - Beat Nelson, Rupp, Trafeh, Curtis In Foot Locker By Over 20 Seconds He also won 5 NCAA individual track titles. *Solinsky Almost Ran Steeple At Stanford, Thought About DNF With Side Stitch Youngsters, this race is a great lesson - so many things had to come together for 26:59 to happen (Rupp to Stanford, steeple/10k switch, side stitch going away, perfect weather ...). But the first thing was years and years of consistent work. 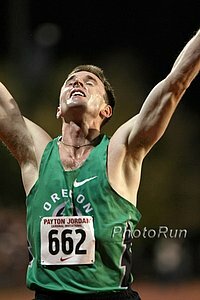 *Blogger: Solinsky/Rupp Was Like Keflezighi/Kennedy 9 Years Ago We hadn't thought about this comparison. Blogger talked to Meb, who says his best days are still ahead of hiim. What Do Pros Think About Barefoot And Minimalist Running? Answers From Geb, Hall, Kara ... Article from Racing Weight author Matt Fitzgerald. No Fun On Top: Isinbayeva Says She'll Return To Sport Next Year Not having any fun (aka losing), Isinbayeva is taking some time off not long after signing some huge sponsorship deals. Asafa Powell Has Gay And Bolt In Sights Powell secretive when asked about why he didn't run Penn Relays. Unnamed Jamaican At Indoor Worlds Returns A-Sample Positive Bolt wasn't at indoors so the sport is okay. Austrian Marathoner Partnered With Former Dope Scandal Coach Skips 1-Hour Rule Test, Accepts Ban She says the 1-hour rule is too invasive. It's people like her husband who are responsible for that rule. US 25km Championships Return To Grand Rapids This Weekend - Elite Entrants 4 years ago, Fernando Cabada set the US 25km record and people were going nuts on the message boards. Play On ... Jamaica International Recap - 40,000 Watch Bolt, Gay, Jeter, Howard Run And Jump To Top Performances Track is popular, just not in rich countries.